I received my Mother’s Little Helper as part of a DavidsTea gift set (it came with three teas and a travel mug) – the gift set that started my interest in tea. The container is nice and small. It’s a metal tin with a screw-on lid that has a clear window so I can see the tea without opening it. Of course, this exposes tea to light if you don’t put these tins in a box or cabinet. It is a very nice looking tea – there’s clearly flowers and lemongrass in there. Opening the tin, I can smell peppermint, it is very strong. Underneath the refreshing mint scent is lemongrass. This tea has an interesting blend of ingredients: peppermint, lemongrass hibiscus, rosehips, chamomile, valerian root, and cornflowers. It also has added peppermint flavouring. It’s a very nice calming mix, I quite like mint for that. Mother’s Little Helper is marketed as a calming tea to help people with unwinding. It definitely has the fragrance to sell that. 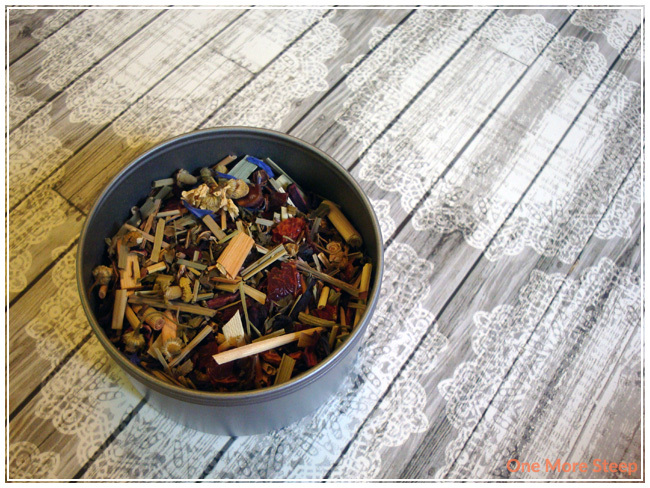 As a calming, herbal infusion, it is naturally caffeine free. Steeping recommendations by DavidsTea is to steep in 96°C (205°F) water for 4-7 minutes. 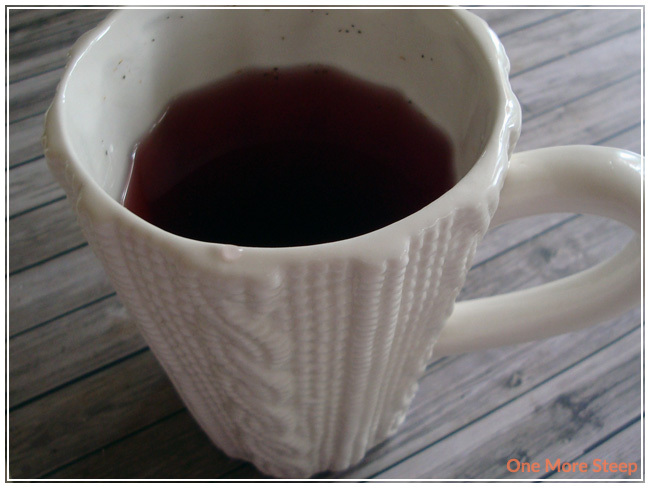 Steeped for 7 minutes, the tea is a beautiful deep pinkish red colour. The scent of peppermint and lemongrass is very obvious. With a sip, Mother’s Little Helper is minty – that peppermint flavouring is more than enough of a punch the senses. It’s a very relaxing tea, definitely caffeine free because I don’t get that energy I get from drinking other teas. It does have a certain flavour that I find makes my mouth pucker a bit – it’s likely the combination of the valerian root, the lemongrass, and the peppermint. I do find that it makes me feel relaxed (likely due to the valerian root). Valerian root is used in alternative medicine to treat insomnia, it’s no wonder it makes me feel relaxed! I hardly ever resteep herbal infusions. I did try with this one, the colour was not as deep and the flavouring just was not there. Mother’s Little Helper is really just good for one steep. 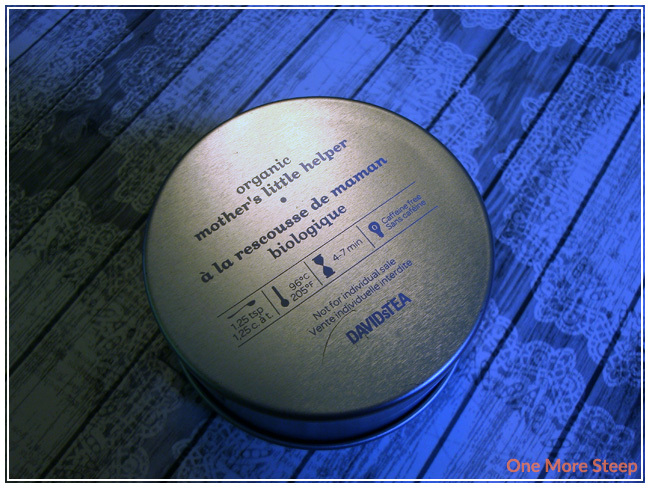 I thought that DavidsTea’s Organic Mother’s Little Helper was just okay. Perhaps it’s because I don’t spend my days running after small children or have kids of my own, but it isn’t a tea that I will keep going back to in my tea stash. I think it does have great flavour and does live up to expectations of being a relaxing tea, but it isn’t something that I would necessarily want to have on a regular basis. I still have the rest of my little tin, but I won’t be dipping into it too often. For anyone looking for a really good night time tea, or just searching for a caffeine free herbal infusion, this is a nice one! It’s just not for me.